This game started with a move in the lower right corner. Traditionally the first move is under the heart of the opponent, in the top right corner. Hoshi is a fast move, generally making an accent for the influence and in most case giving the opponent a small territory in the corner. The fuseki is not by any means standard. White 1 takes another hoshi. 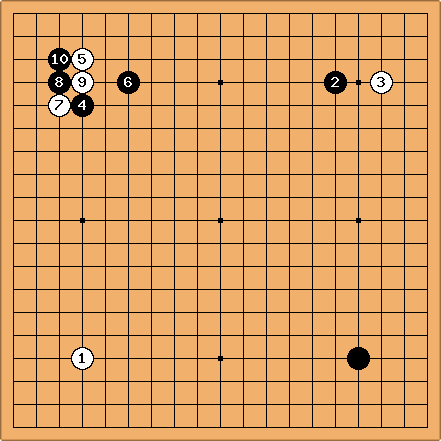 Recently White does not move in the diametrically opposite corner, letting Black choose the type of fuseki. Basically, because of a claim that stronger players prefer this. Black 2 is at the 5-4 point, meaning a large scale center oriented game. White 3 follows the advice to take komoku versus 5-4 or 5-3 as early as possible. I doubt if this was the earliest possible moment. 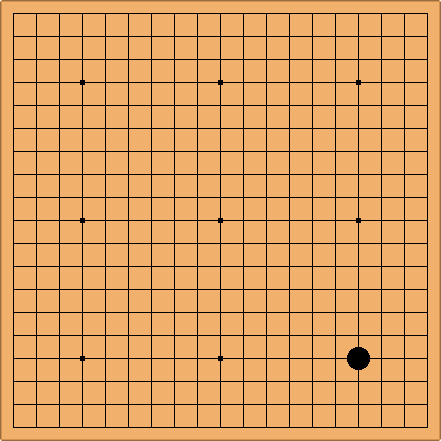 White could take an empty corner and let Black make a shimari. The game would return to more usual ways then. Supprisingly, Black makes another 5-4 move in the different corner and White follows with an immediate komoku. Black 6 choses the left top corner as a target for attack. White replies with 7. Actually White does not know joseki and just wants to settle quickly. Black 8 came as surprise. It does not seem a good continuation for Black. Naturally White cut with 9 and Black played 10 as if refusing to continue his early strategy of orientation to the center.